By Ptr. Benjamin Gevera, Adm. Pastor of Sabang Church of Christ Disciples, Inc.
March and April are months when we celebrate the Lenten and Easter Season. Here, we are called to humility and repentance that is “ more than ashes and sackcloth.” Our teaching, serving, and living as Christians do not last only for a day of penitence. It is a life long fulfillment of the love practiced. As we celebrate the life of Jesus, may we sympathize with the Lord’s passion and compassion towards those “ like a sheep without a shepherd.” As Christians, let us love one another with a love that surpasses understanding and encompasses the whole creation. By the time of St. Augustine, the period had become a time of preparation for all Christians, baptized or not, in that time of the year nearing the Lord’s passion. It is a season dedicated to penitence, to the mourning of sins as the church recollects the Lord’s forty days in the wilderness. The Lenten Season of the United Church of Christ in the Philippines, as well as for the whole Philippine nation, ought to be a time of MOURNING for all. We have denounced the heartlessness of our government representatives who dealt those brutal blows on a people voicing out their sentiments on the continued baseless increase in oil price, basic commodities, and the deafened ears on the people’s cry for a wage increase. We denounced graft and corruption, and the evil of immorality that happens in the life of the country today. But, we cannot just go on looking at the other’s specks in the eye and fail to see the logs in ours. We, too, must repent of our heartlessness in our varied businesses and our corruptions for we have not been much too honest in the carrying out of the same. We, too must cry against our own unwarranted decrees against our own members, our brothers and sisters in the Christian Community, our subordinates in offices, in the classrooms, our unjust and often inhuman treatment of each other at home, in the open roads, in the public transportation- belching smoke upon smoke against the riding public and the walking people. We have not been wanting in our display of arrogance and inhumanity when we drive around in our cars alone, or leaving unused our electric lights and electric fans on, throwing garbage/trash where we will, unmindful of the endless toils of Metro Aides and the pollution we add to that of the business people. The Lord’s forty days in the desert or Israel’s forty years in the wilderness are ours, too. We, too, are lost and tempted in many ways. The difference between Jesus and us is that, we so easily fall into temptation and don’t often know in fact, that we have. And so we live broken lives. Whether we be in government, in church, or in private business, or whether we are with non-government agencies or simply on our own: we succumb, we join the jeering crowd, we cast the first stone, we fall. Hence, we must contemplate this period of repentance. 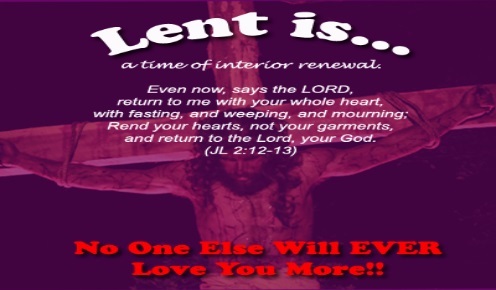 Lenten Season is a journey from death to life. In it we enter into the depths of the agony and sufferings of Jesus Christ. And so this journey from death to life becomes our journey to wholeness and holiness. This is the essence of our faith which is our hope that will always be there to change and will manifest the glory of God in us, until the Kingdom comes. So we invite you to faithfully enter into this journey. And let it be truly a journey from all the deaths that plague our lives daily into a life eternal, which is the very quality of the life of God. Let us be on our way, then. And let us be together in Hope and in Spirit!